Our goal is to achieve the highest quality of endodontic treatment and personal care for our patients. We believe in providing a comfortable atmosphere during treatment and strive to make every visit to our office as pleasant as possible for all our patients. 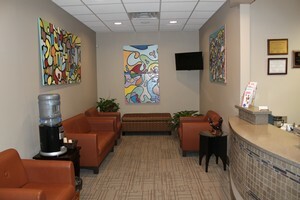 Our office looks forward to providing gentle endodontic care to the adults and children of our community. First and foremost, we believe that people should have their own healthy teeth for an entire lifetime. My staff and I are committed to providing patients with respect and valuable care in both a warm and nurturing environment. Our practice will go above and beyond to provide patients with education and understanding of endodontics to help assist them in making appropriate treatment decisions. The surgical operating microscope offers increased magnification and illumination to visualize precise endodontic treatment. We use digital radiography to achieve higher resolution, and reduce the exposure time of radiation to our patients. Our practice uses a "paperless" record keeping system through the use of The Digital Office endodontic practice software. This allows our patients and referring doctors the ability to view and update information online at their convenience. Online registration is a time saving advantage for our patients so feel free to contact our office for more details and instructions about this process. 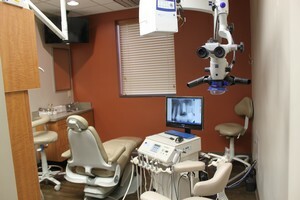 As a general dentist, I refer many patients for root canals, and then verify the work when they return to my office. Not only is Dr. Mickens' work outstanding, but the patients also tell me how wonderful his staff is. Due to this, I have referred my friends and family members to Dr. Mickens. Even I am a patient of Dr. Mickens, and I want to thank him and his entire staff for the care they give to all of their patients. Being a life-long dental phobic, when told I needed a root canal, I panicked. I had always heard horror stories how they hurt really bad, wouldn't get numb, took hours and hours to complete, etc. I waited until it absolutely had to be done. My dentist scheduled me with Dr. Mickens. From the minute I walked into his office, I was put at ease. His receptionist, Beth, was wonderful and assured me I had nothing to worry about. Still....When getting my tooth x-rayed, the technician was very gentle and took her time to make sure it was done right. Still...I was still a little apprehensive... Then I met the Doctor...He shook my hand and also assured me I was in good hands - he applied a topical before the injection - I never felt a thing. The whole time he was working on my tooth, he explained what he was doing and what to expect - very compassionate doctor. What amazed me was it only took around 45 minutes - start to finish - and I had a really difficult tooth to work with. Did I mention I never felt a thing? Truly. Totally painless. I was amazed - this experience was nothing like I had been warned about. There was some pain after the numbing wore off because my tooth was infected, but I was given medication to knock the pain out. Today, the day after, I'm totally pain free, just a little sore. Dr. Mickens called me twice to check on me - that showed me that it wasn't about just doing the work and shooing you out the door - he truly cares that it's a positive experience and that he's taken care of the problem. I can't say enough good things about Dr. Mickens and his office staff. Very professional - I wouldn't hesitate to have another root canal, as long as Dr. Mickens was the one in the chair beside me. Plus he has great music on his radio... :) Thanks to all of you, I truly appreciate you! First of all I am a CHICKEN when it comes to the dentist. Second, I was told that a root canal was the worst thing a person could have done to their teeth. I had my first root canal today 3-19-2013 and I realized real quick that I had wasted a lot of time worrying about this visit. Dr. Mickens and his staff are remarkable. They recognized the fear I had and knew exactly how to respond to this fear. They managed to calm me down. The fear was so bad that it wouldn't have taken a whole lot for me to walk out. Dr. Mickens walked me through the whole process and checked on how I was doing the entire time. NOT ONCE did I experience pain. I would highly recommend Dr. Mickens and his entire staff. They are all wonderful. I owe Dr. Mickens and his whole staff a big big THANK YOU!!!! He is the best! I went to see Dr. Mickens because I had a dull pain in my tooth, jaw, and ear. After doing tests he said he couldn't find much wrong with it, and told me to come back if the pain got worse. I came back a couple weeks later, he did the root canal, and now I feel great! No dull pain and no pain when I chew! The root canal was so challenging that even my dentist was in awe of what a great job he did and he showed it off to many of his colleagues. I high recommend Dr. Mickens to everyone. He is great at what he does, and he cares about his patients and he puts them at ease! My visit with Dr. Mickens was GREAT! He performed a root canal and I experienced NO PAIN during or after the procedure. Dr. Mickens and his staff were awesome and I would recommend them to anyone needing any endodontic care. I had been experiencing great pain because of a horrible tooth in my mouth. I was given an appointment from my friend and dentist Dr. Zachary Hairston. I came to Dr. Mickens' office and was greeted joy. The staff worked through their lunch to make certain that the pain I was in had been addressed. DR. MICKENS IS THE MAN!!! The root canal was PAINLESS and also done with great care. I was treated like the only patient that he had, and even the office staff assured me prior to the procedure, Dr. Mickens will take great care of me, and there would be no pain! She was right! I recommend Dr. Mickens to everyone. Great job, and you have a friend for life! I first met Dr. mickens in 2011 when I found myself needing a root canal after first having the crown. It was my second root canal and considering the circumstances, I really needed to be sure the procedure was necessary. He tested the tooth thoroughly and when not 100% convinced it was necessary at that time, I had to convince him to do it! This was a first for me and I strongly recommend Dr. Mickens to anyone who desires the services of an endodontic that will only do a root canal if it's absolutely necessary. Dr. Mickens and his staff are simply outstanding and deserve the highest rating there is. I work for a general dentist and have been referring to Dr. Mickens for months now. I am always greeted by his friendly staff and never left feeling that they are too busy to help our patients in need. As it turns out I needed emergency treatment this week and Dr. Mickens was there for me with no hestitation. The doctor and the assistant were very gentle and caring during the procedure. He is simply a delight to be around and seems to love what he does. The staff is just the same and really seem happy to be employed by him, which is always a wonderful thing. I am so thankful to everyone there and will be referring all my friends and family as well as patients who need a specialist. Thank you Dr. Mickens and staff!!!! I must say I was one of those people that puts off dentist work because I was afraid of the needle. I would search and search for a dentist that used the nitrous but when I went to see Dr. Mickens last week I was of course nervous but they assured me that it would be ok and that they would explain everything that was going to be done prior to doing it. I had a retreat of a previous root canal and I did this with no nitrous at all and everything was great. Not only did I receive a call the next day from Dr. Mickens to check on me after I also received a call that two days later, a Saturday, to check on me as well. The office staff is great and the atmosphere is very calming and relaxed. I am one who hates to have my teeth poked and prodded. I don't like the sound, the feel, and well... all of it! And to be honest, I don't hate it, I am just afraid of it! Dr. Mickens and his staff have always been kind, responsive, helpful, and manage to put my mind at ease when I come see them. My first appointment, I felt like I had been going there for years! Dr. Micken's doesn't run a factory like office. He takes time with you to make sure you are comfortable with the procedure(s) and checks on your comfort level once you are done. Thanks so much for making my experience less frightening! Dr. Mickens and his staff are wonderful and always so caring! Thank you for taking such great care of my friends and co-workers. Went to This office yesterdsay for a Root canal.The staff was very professional,office area was clean,and Dr.Mickens did an Awesome Job!!!! Dr. Mickens and his staff has dealt with me on a couple of occasions and they are fantastic! They are professional and caring at the same time very top-of-the-line. I would highly recommend him to anyone! I was recently referred to and had a root canal done by Dr. Mickens. I was pleasantly surprised by the professionaism of the entire operation. I was met with a smile and friendly greeting from the receptionist and then asked to check my patient information with the paperless registration system. Very simple,fast, and you know it is correctly entered. Dr. Mickens was very professional and told me everything he saw,what he was doing, and why. I actually found the procedure quite interesting. I recommend Dr. Mickens and his staff for any Endodonic Procedure you may have to have.